This has been a year of firsts. So, on this trip, I have another first. After Hubs flew off on the Sunday, I decided to stay on my own for an extra night in Lisbon. I worked out the cost of Sunday flights. It was cheaper to fly out on Monday, and stay overnight in a hostel. After all the experience of staying in albergues this year, I think I could cope. I am a not-in-my-youth traveller, so I wasn’t sure what the scene would be like. Albergues are different. They cover the age spectrum including the beyond youth stage. Thank goodness for sites like HostelWorld. Actually, thank goodness for HostelWorld. I could look at the locations and look for the highly rated ones. 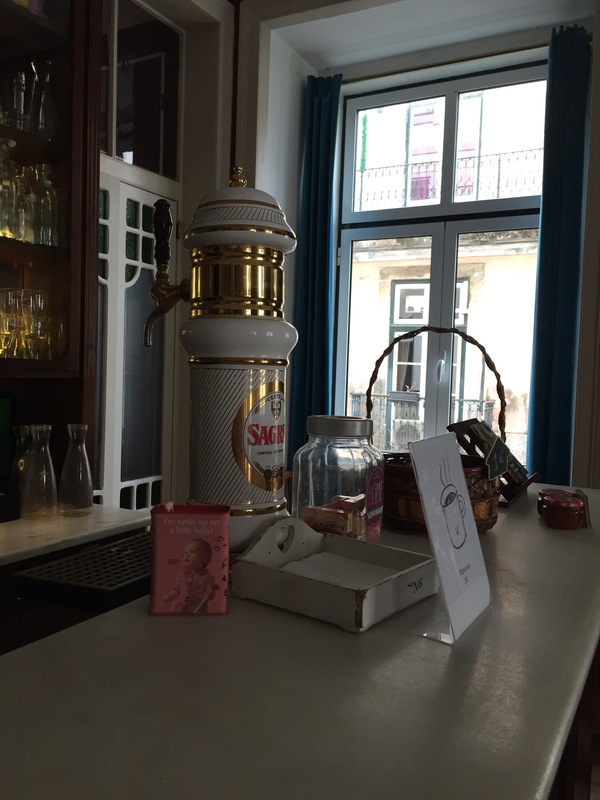 Seeing that I was going down market in the accommodations, I chose the very best I could find in Lisbon close to Baixi-Chiado, where I can been staying the night before. 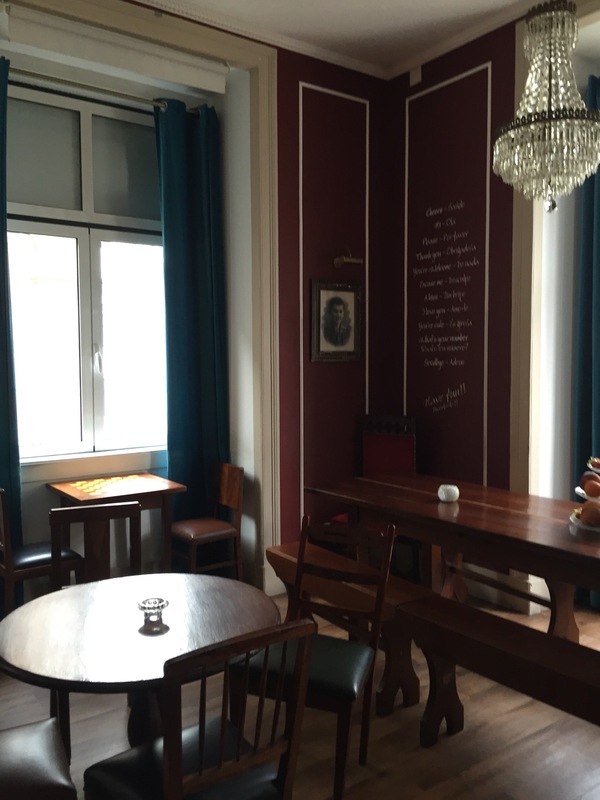 Reviewed at 9.8 on HostelWorld, I chose a place called Home Lisbon Home. After I saw Hubs off at the Baixo-Chiado metro, I walked across the valley to the other side. 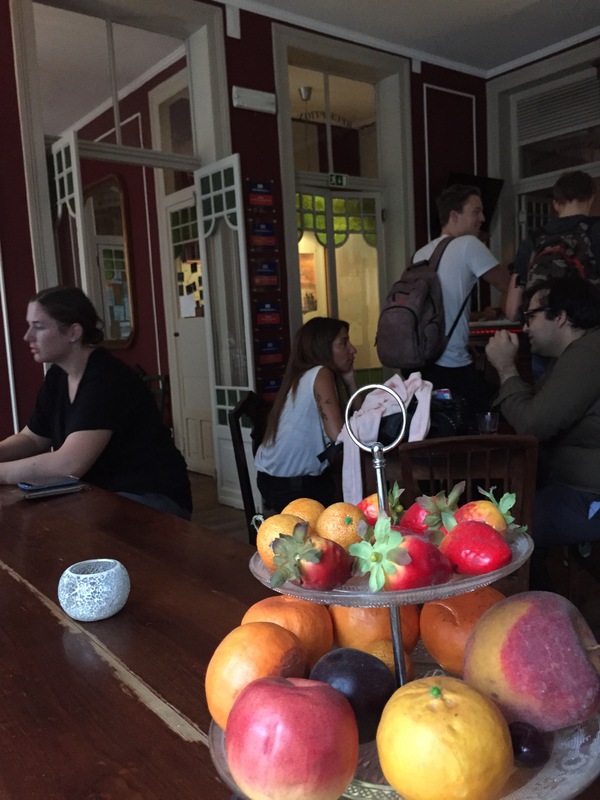 The hostel was located at the bottom of the hill towards the Alfama district. Lisbon is so hilly that if you are plotting a route, it is not so straightforward as there are dead ends and winding streets to navigate. Places are much farther than it seems. As I made my way across town, I peered into many a Pasteleria. It was Sunday afternoon, and many shops were closed, except for the Pastelerias and restaurants. A few waiters tried to stop me to eat at their restaurant. But I was full from lunch, and I wanted to get to where I’d be sleeping next. I had some trouble finding the place. I realised later (after walking up and down the street) that the hostel was in this rather rundown building. Uh oh. Have I made a mistake? I looked up at the building, and looked around. Ah well, not much doing other than to trust the 9.8 star rating and press the buzzer. Climbing the stairs, the first 2 levels looked quite run down. The doors that were there were barred with metal steel doors and painted exactly the same colour as the wall. Usually this is a sign of something isn’t really being looked after. After being buzzed in on the second level, I stepped into a whole new world. I was actually quite amazed that such a wonderful cafe bar was actually here. The reception was a traditional bar, and they had wooden tables on wooden floors. There were swing doors with coloured class and the windows opened out into Juliette balconies where you looked over to the next abandoned building and also to the pedestrians walking in the passageway below. In the next room there was a sitting room, filling with comfortable couches, a large television and shelves filled with books and DVDs. What I liked the most were galleries of family pictures everywhere. After being introduced to the place, checking in and being introduced to other guests who happened to be in the area, I made my way to the dorm 2 floors above. With 4 to a room, it was as cozy as anything. Each bed had a powerpoint and light and the bunk beds were super sturdy. It was such a cozy place, I decided to stay on for a drink and dinner. Dinner reminded me of dinner on the camino. Everyone chipped in their 10 Euros for Mama’s all you can eat dinner, and all you can drink wine. The community feel was just lovely, and I highly recommend this place. To be honest, I liked it even more than the hotel we stayed at. Even though you share shower rooms and toilets, they were very clean and the environment just overall felt very cozy. I was very pleased with my first experience of a hostel. Of course, as someone said to me today, if you’ve survived the albergues on the camino, this is complete luxury by comparison. There is some truth to that. 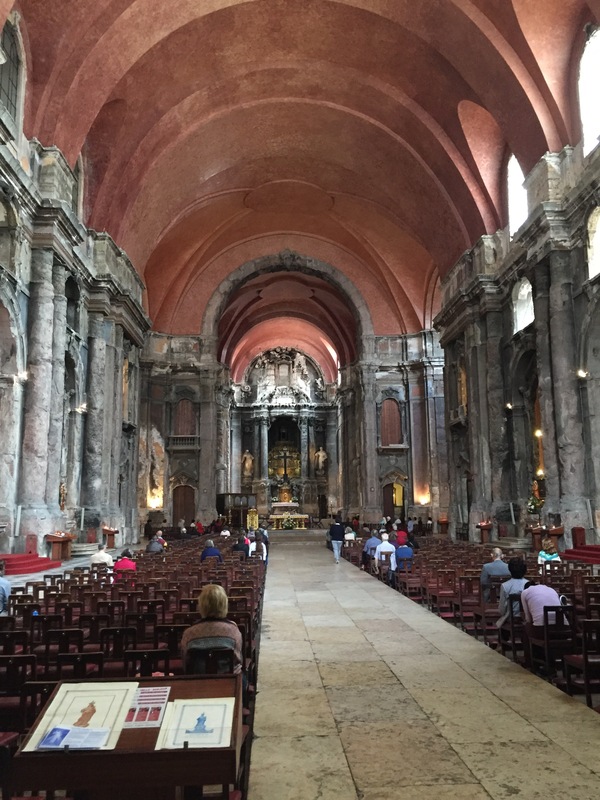 The next day, I had a light breakfast before joining the organised walking tour of Lisbon. It was very good to put some history into context and I enjoyed it very much. After that, it was a simple trip on the metro to the airport. I won’t deny, I felt a bit sad returning home from my adventures, and back to English reality of drizzly rain and cool weather. Comfortable wooden tables and chairs to chill and relax. Guests hanging about fir a drink in the evening. An unusual church. The church of Santo Domingo had been affected by fire. They decided to keep the charred look and red washed the walls. A very different looking church.